toothed.There are about 260 species in 9 genera with 2 subfamilies. Shell about 1.5 cm in diameter and 8 mm in height. In northern Florida to Tampa in the west. The parietal callus has a long tooth. Aperture oblique with a parietal tooth. Height 2.8-3.7 mm and width 5-6.5 mm with 4.6-5 whorls. Aperture round oval with two teeth. darker band above the periphery. The aperture has a two branched tooth on the parietal callus.. Height 5 mm and width 10-11 mm with 5.5 whorls. Aperture with a parietal tooth. Height 2.8-3.1 mm and width 5.5-7.7 mm with 5 whorls. 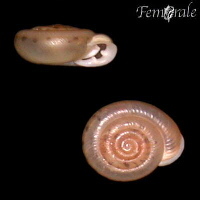 Shell umbilicate,depressed,shiny,dark or pale horn in color. Aperture round oval with 3 teeth. Height 3.6-3.9 mm and wdth 6.3-8.2 mm with 6 whorls. The shell is about 7-15 mm in diameter and 3-4 mm in height. In grass in acid soil. 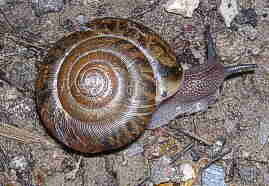 The shell is about 1 cm and light-brown. In Bermuda and the Western Bahama's. Shell disk-shaped,thin,yellowish to brown.Strongly marked with axial ridges. The aperture has a single tooth. Diameter 7-18 mm,height 4 mm. A very common species in southern Florida living on calcereous soil. There is a lot of difference in size in colonies. Shell discoidal with a pale greenish-yellow color,a little translucent and glossy. Height 3.7-5 mm and width 9.3-12.5 mm with 6.5-8 whorls. The shell is about 8-13 mm in diameter and 5-9 mm in height. The aperture has a long white or pinkish tooth. In Arkansas to Virginia and Ohio to Georgia. Shell pill shaped,9 mm in diameter and 6 mm in height,periostracum hairy. Shell imperforate,spire convex,brown,aperture narrow with a parietal tooth. Basal lip is brown with a thin outer margin. Height 4.7-6.2 mm and width 6.4-9 mm with 5.25-5.5 whorls. Shell umbilicate,spire convex and low,whorls very closely coiled,a little translucent and glossy. Aperture round oval with a short white parietal tooth. Height 3.9-5.7 mm and width 6.7-9.4 mm with 5.75-6 whorls. Shell about 19 mm in diameter and 9 mm in height,brownish with a closed umbilicus. The aperture has a long rounded parietal tooth. In Ohio to Virginia to Alabama,Bermuda. The biggest Mesodon it reaches 40 mm in diameter and 24 mm in height. In Tennessee to western North-Carolina. Similar to M.chiloweensis but smaller,25 mm in diameter and 15 mm in height. Shell glossy and yellowish with a narrow lip,usually with two teeth. Ohio to Georgia to Alabama. Shell about 1.7 cm with an closed umbilicus. New York to Ohio and Kentucky. In Western Pennsylvania to Missouri. New York and Illinois to Mississipi and South-Carolina. Shell 18 mm in diameter and 9 mm in height. Umbilicus covered and periostrcum bristly and fuzzy. In Virginia to Georgia and west to Kentucky and Alabama. Shell 31 mm in diameter and up to 25 mm in height.Glossy and usual with a parietal tooth. Canada to North-Carolina and west to Wisconsin and Oklahoma. Shell about 2.4 cm,yellowish-brown with a thick white lip. In North-East USA in humid dead leaves. Shell 28 mm in diameter and 16 mm in height,aperture with a parietal tooth. In Canada and Maine to Georgia and west to Mississippi and Iowa. Shell about 13 mm in diameter and 6 mm in height . 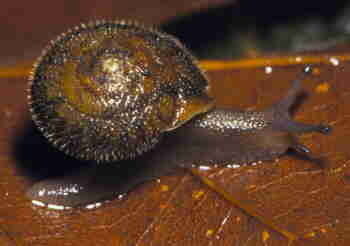 In Virginia to Florida and Alabama living on coastal plains,a common urban snail. North-Carolina to North-Florida and Alabama,close to brackish water. basal lip and a strong parietal tooth. In Alabama to Iowa,but also in New Jersey. 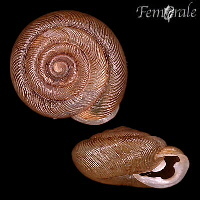 Shell 26 mm in diameter and 13 mm in height.The periostracum has short,stiff hairs. It has a blade-shaped lamella on the basal lip. In Canada and Vermont to georgia and west to Illinois and Arkansas. Shell umbilicate,depressed,with a dome-shaped spire,dark olive-brown.Closely coiled whorls. Height 7.5-8.2 mm and width 11.8-12.4 mm with 5.5 whorls. Shell depressed-globose,solid,cream buff to chamois colored. Height 16-18.7 mm and width 25.5-31 mm with 5-5.5 whorls. In Quebec,Ontario,United States:Maine to South-Georgia and west to the Mississppi river. Similar to T.denotata but it has a strong sharp keel along the periphery. In South-Carolina and Georgia west to Louisiana and Arkansas. Shell about 3 cm,in deep woods. Larger than C. mullani and has the thickest point of the swelling on the basal lip located closer to the columella than to the periphery. Smaller than C.mullani.In British Columbia,Washington and Oregon. umbilicus small.Juveniles have minute hairs on the periostracum,these can still be present in adults but usually fall off. Aperture oval with a white parietal denticle,lip thick and white,strongly bend backward. Width to 16 mm with 4.75-5.5 whorls. Habitat:Near streams under rocks,logs and leaflitter from 500-1800m. Distribution:Southeast British Columbia; Washington east of the Cascade Mountains to northeast Oregon and east through Idaho to western Montana. Images copyright 1902 by Dodd,Mead & company.